"Why, yes, yes we are. Thank you for asking." I had a feeling that we would come home with one kitten when we visited my in-laws place last week. The Affectionate One has been asking for a kitten for months. And, honestly, it was getting more and more difficult to refuse her. After all she has big blue eyes, twin dimples and a sweetness about her. I have a feeling that's also why Papaw always manages to have her favorite candy around when she visits. And when we said yes, Whirling Dervish came into the house having picked out a kitten of his own. Again, with the big blue eyes and dimples. I could feel my resolve crumbling. After all, how much more work would two kittens be than one? Both of the chickadees were so happy. And I was happy that there was no fighting over a single cat. I looked to The Cruise Director and wondered if he was feeling left out. He seemed okay with petting the other kittens and he wasn't asking for one of his own. So, I let it go and waited to see what would happen. Not long after, I realized the kitten that The Cruise Director was holding belonged to neither The Affectionate One nor Whirling Dervish. And I waited. I knew by then that I couldn't say no after saying yes to the other two chickadees. He has dimples and big blue eyes too. The Cruise Director spent some time changing his mind about which kitten would be his. Much of his decision was based on which kitten would scratch at him the least. Not that I blame him one bit. After much deliberation he settled on an orange kitten and The Affectionate One changed her mind and picked one of the kittens that The Cruise Director had considered but ultimately passed over. Whirling Dervish had picked Nanny's favorite kitten and never wavered from that choice for even a second. Please allow me to introduce you to Tangerine Psyche (who has no collar), Patches May (who has the green collar) and Kissie Lips Explorer (pink collar). Yeah, I said Kissie Lips. The Cruise Director had named her Explorer, but then decided to adopt Tangerine instead. That's when The Affectionate One swooped in and claimed and renamed the kitten to Kissie Lips. I take no responsibility for the unusual names. The kittens were used to being outside and not handled much, so they were a bit terrified at first. And that may be a bit of an understatement. We brought them home and put them in a cage to get acclimated. The chickadees won them over in no time. 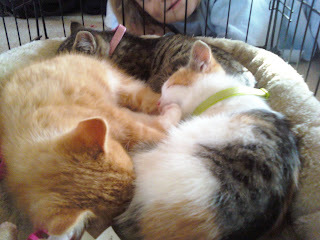 And after four days they still love that cage and often go in to take naps. The biggest challenge is teaching the chickadees how to train the kittens to use the litter box. Rest assured, dear reader, I'll be letting you know how THAT goes . . .